Once investors retire, the priority usually turns to income. Here, they want their assets to generate as much cash as they can with as little risk. In today’s lending environment, CDs and bonds will probably not produce enough money. They could turn to distributions from mutual funds or exchange-traded-funds that hold some of these retirement stocks. However, with the dividend yield of the S&P 500 holding at about 1.9%, they often may not generate the necessary cash either. For this reason, some investors will resort to individual growth stocks. I do not recommend such an approach without thorough research. I also would discourage buying one or two stocks simply because they pay the highest dividend. However, buying the right dividend stocks while protecting oneself with diversification could yield significant amounts of cash without crazy amounts of risk. For example, dividend aristocrats, or stocks that have seen at least 25 consecutive years of dividend hikes, could bolster such a portfolio. Also, real estate investment trusts (REITs), firms that consolidate a group of real estate holdings into a stock-oriented vehicle, could also serve this purpose. REITs can avoid federal income tax by paying out at least 90% of the net income generated from properties as dividends. Health issues often compel retirees to spend large amounts of money on pharmaceutical products. To my way of thinking, this stands as a good reason for a retiree to profit from something that otherwise could cost them large sums of money. Such investors benefit from a large number of baby boomers retiring and from Medicare prescription drug plans. Both factors bolster the case for equities such as AbbVie (NYSE:ABBV) as one of the reliable growth stocks to consider in retirement. ABBV stock offers several benefits. It owns the patent to the world’s best-selling drug, Humira. Humira now faces competition from generics in some markets. Fortunately for AbbVie, its drug pipeline is well-positioned to compensate for this patent expiration. In fact, EvaluatePharma voted AbbVie’s pipeline the second-best for value creation. This value should flow to the company and its stockholders alike. ABBV stock appears well-positioned for bargain hunters (and especially those who are hunting an attractive dividend yield). The stock has fallen nearly 24% from its February highs, which has taken its forward price-to-earnings ratio down to about 11.8. Despite the low multiple, analysts expect the company to increase its profits by 40% this year. On average, they expect 16% annual growth over the next five years. Moreover, due to its history as part of Abbott Labs (NYSE:ABT), it qualifies as a dividend aristocrat despite its founding five years ago. Just last year, annual dividends rose from $2.56-per-share in 2017 to $3.84-per-share. This 50% dividend increase took its dividend yield to above 4%. Its profit growth should enable the company to continue the dividend yield increases in future years. With a low P/E and a high dividend yield that continues to rise, it should stand as one of the growth stocks to which investors turn for years to come. A fortuitous series of events (at least for buyers) may have made AT&T (NYSE:T) one of the more exciting growth stocks to consider in retirement. Investors sold off T stock as high costs and its past association with former Trump attorney Michael Cohen plagued the company. The company struggles on several fronts. Consumers increasingly cut the cord on the company’s pay-TV business while intense competition hurt the profitability of wireless. Moreover, the need to upgrade to 5G wireless technology imposes an expense costing the company billions of dollars every year for the next few years as it struggles to remain competitive. However, as I pointed out in a recent article, T stock may be headed for a “perfect storm” of profits. The company now offers a TV service through its DirecTV unit. Moreover, the first of its 5G will launch soon, so its expensive upgrade will finally begin to generate revenue. All of this comes at an excellent time for those who want to buy T stock. This year’s drop in the stock price has taken its forward P/E down to 9.3. This comes at a time when analysts predict 15.1% profit growth for the year. That will likely slow to levels near the predicted five-year average growth rate of 6.2%. However, with only three (or possibly four) companies controlling a nationwide 5G network, it will find itself in a position to profit. Moreover, AT&T holds dividend aristocrat status. This has placed AT&T in the position where the stock’s value rests on continual annual dividend increases. This stays true despite its yield of about 6%, more than triple the S&P 500 average. Given its high dividend and single-digit P/E in one of the few companies providing a needed service, T stock should profit its investors with both its dividend and low stock price. Early in the year, I was bullish on Chevron (NYSE:CVX). Despite the delay of my predicted march higher, the fact that the stock price has fallen improves its standing among dividend stocks to consider. Energy prices moved steadily higher in 2016 and 2017, taking CVX stock along with them. However, WTI crude prices have stagnated since April and Chevron stock has also done little in that time, falling by almost 14% from its 52-week high. Now that the equity’s steady move higher has paused, profits have begun to catch up to the CVX stock price. Assuming forecasted earnings of $7.84-per-share hold, that would bring the forward P/E to about 14.7 at today’s prices. A predicted 111.9% profit increase for the fiscal year brought about this low P/E. This increase will likely become a one-time event. However, even though the same analysts’ predicted growth will slow to 14.4% next year, it still means Chevron’s profits will remain sustainably higher. Furthermore, like many retirement stocks, CVX stock holds dividend aristocrat status. The annual dividend of $4.48-per-share brings the dividend yield to 3.8%. Even more important, the 31-year record of annual dividend hikes shows the company can maintain these increases during times of both high and low energy prices. That said, higher prices tend to lead to more significant gains. However, no matter the level of increase, this high dividend and the much lower P/E make CVX one of the more attractive growth stocks for retirement. Given that REITs tend to enjoy dividend yields that are more than twice the size of the S&P 500, those interested in dividend stocks for retirement should look at REITs such as the Senior Housing Properties Trust (NYSE:SNH). Since retirees will spend a large percentage of their income on housing, they might as well profit from the increased demand for retiree and healthcare-related properties. Also, with 10,000-baby-boomers-per-day entering Medicare, the need for both senior housing and healthcare will remain strong. REITs base their dividends on funds-from-operations (FFO) income, or cash flow from operations. FFO income came in at $1.58-per-share last year. This year, analysts expect that to rise to $1.64-per-share. Over the long-term, this keeps income growth in the low-single-digits. However, property tends to appreciate over time. Also, with retirement stocks, cash generation remains the priority. Hence, I would only recommend SNH stock for those who care mostly about generating cash. Due to the requirement to pay at least 90% of net income in dividends, dividend payments will tend to fluctuate with income. However, SNH stock has managed to keep its annual dividend at $1.56-per-share since 2013. This brings the yield to about 8.25%, about twice the overall REIT average. Moreover, if the dividend changes over the next few years, it will likely rise to keep the REIT compliant with the 90% payout rule. Either way, its dividend yield should give retirees a way to derive a large payout while benefiting from something that otherwise costs them a lot of money. Two years ago, brick-and-mortar retailers such as Target (NYSE:TGT) seemed to be left for dead as fears of an e-commerce led takeover by the likes of Amazon (NASDAQ:AMZN) would wipe out all traditional retailers. In fact, Target and its retail peers have now used their store footprint as an advantage over Amazon. The combined online and in-store purchase experience, called omnichannel, places the venerable retailer at a distinct advantage. Now, TGT stock has returned to levels near record highs. Despite this recovery, Target still trades at a reasonable 16.4-times-forward-earnings. This comes in lower than archrival Walmart (NYSE:WMT), and much lower than the triple-digit P/E seen in Amazon. Wall Street also anticipates 14.6% profit growth for the year, driven by its e-commerce platform and improving in-store sales. Although its growth will slow in the coming year, analysts still forecast 7.5% average annual growth over the next five years. 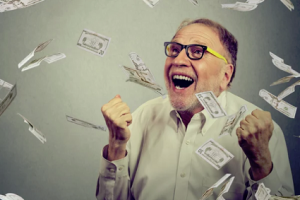 Moreover, like many dividend stocks that are practical for retirement, TGT stock holds dividend aristocrat status with its 47 years of annual dividend increases. This year’s annual dividend stands at $2.56-per-share, a yield of about 2.9%. Now that the company has learned to compete with Amazon, it should find itself well-positioned to continue these increases in future years. No, Amazon will not take over retail. In fact, retailers like Target will thrive as both in-store and e-commerce plays, driving the TGT stock price higher for some time to come. As such, Target certainly earns its place on this list of growth stocks that are worth owning for retirement.